In the Bible, 'church' is all believers in a geographic area, as the church in Corinth, Ephesus, Thessalonica, Rome, etc. The WHOLE CHURCH of the Twin Cities is comprised of more than 3,400 individual congregations. It's impossible for anyone to know and visit all these groups and hold a composite picture in mind. The only way to see the WHOLE CHURCH is through statistics and reports, locally and nationally. This site is the only place where you can see the WHOLE CHURCH of the Twin Cities metro and track its component parts. To grow in numbers and pass Christian faith to next generations, churches need to be relevant in modern society. Culture in the Twin Cities is changing, and changing fast! Half of the people in the Twin Cities are now Millennials or Gen Zs – under age 38 – and nearly one-third are people of color. The new generations think and react different than the older white generations. This site is an easy way for leaders to get the facts about powerful cultural trends affecting our churches. This reveals new and better ways of influencing people and making disciples in the modern world. We stopped Millennials at random on Minneapolis streets and asked what they think about the Bible. Big challenge for the church! CLICK to hear what they said. The 'Nones' (Dones, Agnostics and Atheists) are gaining rapidly as share of Twin Cities population as older generations of Catholics, Evangelicals and Mainline are dying off. CLICK for the chart. 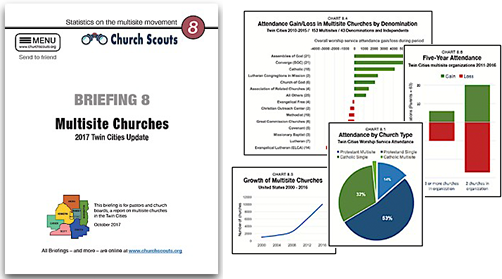 How many multisite churches in our metro? What locations? What sizes? What denominations? What growth/decline? Overall success? CLICK to see the stats.